As with the rest of the continent, the region had been long occupied by the indigenous Aboriginal peoples, who were organised into numerous tribes and languages. The first British settlement to be established was Kingscote, Kangaroo Island, on 26 July 1836, five months before Adelaide was founded. The guiding principle behind settlement was that of systematic colonisation, a theory espoused by Edward Gibbon Wakefield that was later employed by the New Zealand Company. The goal was to establish the province as a centre of civilisation for free immigrants, promising civil liberties and religious tolerance. Although its history is marked by economic hardship, South Australia has remained politically innovative and culturally vibrant. Today, it is known for its fine wine and numerous cultural festivals. The state's economy centres on the agricultural, manufacturing and mining industries and has an increasingly significant finance sector as well. The first recorded European sighting of the South Australian coast was in 1627 when the Dutch ship the Gulden Zeepaert, captained by François Thijssen, examined the coastline. Thijssen named his discovery "Pieter Nuyts Land", after the highest ranking individual on board. The land which now forms the state of South Australia was claimed for Britain in 1788 as part of the colony of New South Wales. Although the new colony included almost two-thirds of the continent, early settlements were all on the eastern coast and only a few intrepid explorers ventured this far west. It took more than forty years before any serious proposal to establish settlements in the south-western portion of New South Wales were put forward. In 1834, the British Parliament passed the South Australia Act 1834 (Foundation Act), which enabled the province of South Australia to be established. The act stated that 802,511 square kilometres (309,851 sq mi) would be allotted to the colony and it would be convict-free. In contrast to the rest of Australia, terra nullius did not apply to the new province. The Letters of Patent attached to the Act acknowledged Aboriginal ownership and stated that no actions could be undertaken that would affect the rights of any Aboriginal natives of the said province to the actual occupation and enjoyment in their own persons or in the persons of their descendants of any land therein now actually occupied or enjoyed by such natives. Although the patent guaranteed land rights under force of law for the indigenous inhabitants it was ignored by the South Australian Company authorities and squatters. Settlement of seven vessels and 636 people was temporarily made at Kingscote on Kangaroo Island, until the official site of the colony was selected where Adelaide is currently located. The first immigrants arrived at Holdfast Bay (near the present day Glenelg) in November 1836, and the colony was proclaimed on 28 December 1836, now known as Proclamation Day. South Australia is the only Australian state to be settled entirely by free settlers. The plan for the colony was that it would be the ideal embodiment of the best qualities of British society, that is, no religious discrimination or unemployment and, as it was believed that this would also result in very little crime, no provision was made for a gaol. In early 1838 the colonists became concerned after it was reported that convicts who had escaped from the eastern states may make their way to South Australia. The South Australia Police was formed later that year to protect the community and enforce government regulations and the first gaol, a two-room hut, was opened on 1 January 1839. South Australia granted restricted women's suffrage in 1861, and in 1895 became the second place in the world to grant universal suffrage (after New Zealand), and the first where women had the dual rights to vote and to stand for election. Autumn at the Mount Lofty Botanic Garden, located near Mount Lofty in the Adelaide Hills. The rugged coastline of Second Valley, located on the Fleurieu Peninsula. The terrain consists largely of arid and semi-arid rangelands, with several low mountain ranges. The most important (but not tallest) is the Mount Lofty-Flinders Ranges system, which extends north about 800 kilometres (497 mi) from Cape Jervis to the northern end of Lake Torrens. The highest point in the state is not in those ranges; Mount Woodroffe (1,435 metres (4,708 ft)) is in the Musgrave Ranges in the extreme northwest of the state. The south-western portion of the state consists of the sparsely inhabited Nullarbor Plain, fronted by the cliffs of the Great Australian Bight. 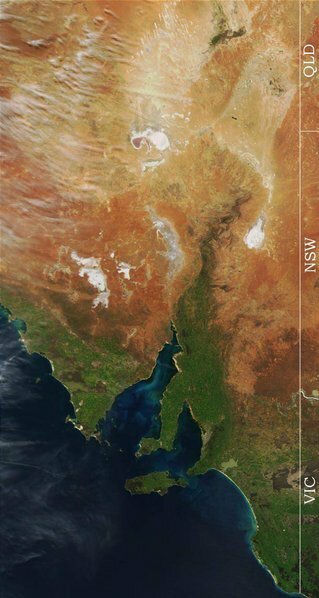 Features of the coast include Spencer Gulf and the Eyre and Yorke Peninsulas that surround it. South Australia has boundaries with every other Australian mainland state and territory except the Australian Capital Territory. The Western Australia border has a history involving the South Australian government astronomer, Dodwell, and the Western Australian Government Astronomer, Curlewis, marking the border on the ground in the 1920s. The southern part of the state has a Mediterranean climate, while the rest of the state has either an arid or semi-arid climate. South Australia's main temperature range is 29 °C (84 °F) in January and 15 °C (59 °F) in July. Daily temperatures in parts of the state in January and February can be up to 48 °C (118 °F). The highest maximum temperature was recorded as 50.7 °C (123.3 °F) at Oodnadatta on 2 January 1960, which is also the highest official temperature recorded in Australia. The lowest minimum temperature was −8.2 °C (17.2 °F) at Yongala on 20 July 1976. Aerial view of vineyards in the Barossa Valley, a major wine producing region, and a major source of employment in the area. State export earnings stood at A$10 billion per year and grew by 8.8% from 2002 to 2003. Production of South Australian food and drink (including agriculture, horticulture, aquaculture, fisheries and manufacturing) is a $10 billion industry. South Australia's economic growth has lagged behind the rest of Australia (2.1% from 2002 to 2003), particularly since the collapse of the State Bank, but performance seems to be improving. South Australia's credit rating was upgraded to AAA by Standard & Poor's Rating Agency in September 2004 and to AAA by Moody's Rating Agency November 2004, the highest credit ratings achievable by any company or sovereign. The State had previously lost these ratings in the State Bank collapse. South Australia's Gross State Product was A$48.9 billion starting 2004, making it A$32,996 per capita. Exports for 2006 were valued at $9.0bn with imports at $6.2bn. Private Residential Building Approvals experienced 80% growth over the year of 2006. South Australia's economy includes the following major industries: meat and meat preparations, wheat, wine, wool and sheepskins, machinery, metal and metal manufactures, fish and crustaceans, road vehicles and parts, and petroleum products. Other industries, such as education and defence technology, are of growing importance. In 2013, South Australia was named by Commsec Securities as the second lowest performing economy in Australia. While some sources have pointed at weak retail spending and capital investment, others have attributed poor performance due to declines in public spending. South Australia is a constitutional monarchy with the Queen of Australia as sovereign, and the Governor of South Australia as her representative. It is a state of the Commonwealth of Australia. Its bicameral parliament consists of a House of Assembly (lower house) and a Legislative Council (upper house), with legislative elections held every four years. The main responsibility of this body was to draft a constitution for South Australia. The body drafted the most democratic constitution ever seen in the British Empire and provided for universal male suffrage. It created the bicameral Parliament of South Australia. For the first time in the colony, the executive was elected by the people and the colony used the Westminster system, where the government is the party or coalition that exerts a majority in the House of Assembly. In 1894, South Australia was the first Australian colony to allow women to vote and it had the first Parliament in the world to allow women to be elected as members. In 1897 Catherine Helen Spence was the first woman in Australia to be a candidate for political office when she was nominated to be one of South Australia's delegates to the conventions that drafted the constitution. South Australia became an original state of the Commonwealth of Australia on 1 January 1901. There are three public and three private universities in South Australia. 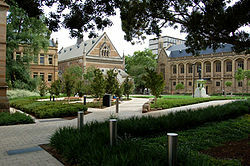 The three public universities are the University of Adelaide (established 1874), Flinders University of South Australia (est. 1966) and the University of South Australia (est. 1991). The three private universities are Carnegie Mellon University - Australia (est. 2006), University College London's School of Energy and Resources (Australia), and Cranfield University. All six have their main campus in the Adelaide metropolitan area: Adelaide and UniSA on North Terrace in the city; CMU, UCL and Cranfield are co-located on Victoria Square in the city, and Flinders at Bedford Park. 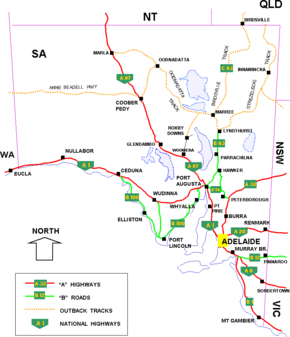 South Australia has four interstate rail connections, to Perth vie a the Nullabor Plain, to Darwin through the centre of the continent, to New South Wales through Broken Hill, and to Melbourne. South Australia has extensive road networks linking towns and other states. Roads are also the most common form of transport within the major metropolitan areas with car transport predominating. Public transport in Adelaide is mostly provided by busses with regular services throughout the day. Adelaide Airport provides regular flights to other capitals and major South Australian towns. The Airport also has daily flights to several Asian hub airports. South Australia fields two teams in the Australian Football League national competition: the Adelaide Crows and Port Adelaide Power. In 2006, the Adelaide Crows had a membership base of 50,000, higher than any of the other 15 teams in the competition. The South Australian National Football League, which owns the dedicated Australian Football stadium AAMI Stadium, is a popular local league comprising ten teams (Sturt, Port Adelaide, Adelaide Crows, West Adelaide, South Adelaide, North Adelaide, Norwood, Woodville/West Torrens, Glenelg and Central Districts). Cricket is the most popular summer sport in South Australia and attracts big crowds. South Australia has a cricket team, the Southern Redbacks, who play at Adelaide Oval in the Adelaide Park Lands during the summer; they won their first title since 1996 in the summer of 2010–11. Many international matches have been played at the Adelaide Oval; it was one of the host cities of 1992 Cricket World Cup, and for many years it hosted the Australia Day One Day International. South Australia's Association Football (soccer) team in the A-League is Adelaide United F.C. The club's home ground is Hindmarsh Stadium. The club was founded in 2003 and was premier in the inaugural 2005–06 A-League season, finishing 7 points clear of the rest of the competition, before finishing 3rd in the finals. Adelaide United was also a Grand Finalist in the 2006–07 and 2008–09 seasons. Adelaide is the only A-League club to have progressed past the group stages of the Asian Champions League on more than one occasion, making it the most successful Australian club in the International competition. Until the Western Sydney Wanderers won the 2014 Asian Champions League in their maiden attempt. Basketball also has a big following in South Australia, with the Adelaide 36ers playing out of an 8,070 seat stadium in Findon. The 36ers have won four championships in the last 20 years in the National Basketball League. Mount Gambier also has a national basketball team – the Mount Gambier Pioneers. The Pioneers play at the Icehouse (Mount Gambier Basketball Stadium) which seats over 1,000 people and is also home to the Mount Gambier Basketball Association. The Pioneers won the South Conference in 2003 and the Final in 2003; this team was rated second in the top 5 teams to have ever played in the league. In 2012, the club entered its 25th season, with a roster of 10 senior players (2 imports) and 3 development squad players. Australia's premier motor sport series, the V8 Supercar Championship Series, has visited South Australia each year since its inception in 1999. South Australia's V8 Supercar event, the Clipsal 500 Adelaide, is staged on the Adelaide Street Circuit, a temporary track laid out through the streets and parklands to the east of the Adelaide city centre. Attendance for the 2010 event totalled 277,800. An earlier version of the Adelaide Street Circuit played host to the Australian Grand Prix, a round of the FIA Formula One World Championship, each year from 1985 to 1995. ^ Wiktionary: croweater Accessed 11 October 2011. ^ ABC NewsRadio > Wordwatch: Croweater Accessed 11 October 2011. ^ "3101.0 – Australian Demographic Statistics, Mar 2012". Australian Bureau of Statistics. 27 September 2012. http://www.abs.gov.au/ausstats/abs@.nsf/mf/3101.0/. Retrieved 5 October 2012. ^ a b c Most Australians describe the body of water south of the continent as the Southern Ocean, rather than the Indian Ocean as officially defined by the International Hydrographic Organization (IHO). In the year 2000, a vote of IHO member nations defined the term "Southern Ocean" as applying only to the waters between Antarctica and 60 degrees south latitude. ^ South Australian Police Historical Society Inc. Accessed 13 September 2011. ^ "Kangaroo Island Council – Welcome". Kangaroo Island Council. http://www.kangarooisland.sa.gov.au/site/page.cfm. Retrieved 10 August 2010. ^ Ngadjuri Walpa Juri Lands and Heritage Association (n.d.). Gnadjuri. SASOSE Council Inc. ISBN 0-646-42821-7. ^ "Highest Mountains". Geoscience Australia. Archived from the original on 21 April 2006. http://web.archive.org/web/20060421195512/http://www.ga.gov.au/education/facts/landforms/highmtns.htm#state. Retrieved 28 May 2006. ^ "Climate and Weather". Government of South Australia. Atlas South Australia. 28 April 2004. http://www.atlas.sa.gov.au/go/resources/atlas-of-south-australia-1986/environment-resources/climate-and-weather. Retrieved 6 December 2009. ^ "Official records for Australia in January". Daily Extremes. Bureau of Meteorology. 31 July 2013. http://www.bom.gov.au/cgi-bin/climate/extremes/daily_extremes.cgi?period=%2Fcgi-bin%2Fclimate%2Fextremes%2Fdaily_extremes.cgi&climtab=tmax_high&area=sa&year=2013&mon=1&day=11. Retrieved 12 March 2014. ^ "Inquiry into Local Government and Cost Shifting". Australian House of Representatives. 2003. http://www.aph.gov.au/house/committee/efpa/localgovt/submissions/sub308.pdf. Retrieved 11 June 2007. ^ a b "SA Lags on Economic Growth". http://indaily.com.au/news/2013/07/22/sa-lags-on-economic-growth/. ^ "Economic report confirms tough times in South Australia". ABC News. http://www.abc.net.au/news/2013-06-28/economic-report-confirms-tough-times-in-south-australia/4787076. ^ Gemma Daley; Tan Hwee Ann (3 April 2006). "Australia, China Sign Agreements for Uranium Trade (Update5)". Bloomberg. http://www.bloomberg.com/apps/news?pid=newsarchive&sid=aPGvMTxVcp2k&refer=australia. Retrieved 27 April 2012. ^ Ian Lambert; Subhash Jaireth; Aden McKay; Yanis Miezitis (December 2005). "Why Australia has so much uranium". AusGeo News. http://www.ga.gov.au/ausgeonews/ausgeonews200512/uranium.jsp. Retrieved 27 April 2012. ^ "R v Governor of South Australia (1907) HCA 31; (1907) 4 CLR 1497 (8 August 1907)". Australasian Legal Information Institute. 2008. http://www.austlii.edu.au/au/cases/cth/HCA/1907/31.html. Retrieved 19 July 2008. ^ "Legislative Council 1843–1856". Parliament of South Australia. 2005. http://www.parliament.sa.gov.au/about/1_1_1_legcouncil.shtm. Retrieved 28 May 2006. ^ Owen, Michael (22 May 2006). "School leaving age to be raised". The Advertiser (News Corp). Archived from the original on 12 September 2006. http://web.archive.org/web/20060912074512/http://www.news.com.au/story/0,10117,19215505-1246,00.html. Retrieved 28 May 2006. ^ "The Redefinition of Public Education". Archived from the original on 15 February 2008. http://web.archive.org/web/20080215174248/http://www.aeufederal.org.au/Debates/ReidPaper.html. Retrieved 12 July 2010. ^ "Chapter 2: Resourcing Australia's schools". Ministerial Council National Report on Schooling in Australia. http://cms.curriculum.edu.au/anr2008/ch2_student.htm. ^ Bill Daniels (12 April 2004). "Government funding should encourage private schools not penalise them". http://www.onlineopinion.com.au/view.asp?article=2119. Retrieved 16 February 2010. ^ "South Australia signs up to Federal Government's Gonski education reforms". http://www.abc.net.au/news/2013-06-14/sa-signs-up-to-gonski-education-reforms/4753742. ^ 4174.0 Sports Attendance, Australia, 2005–06, 25 Jan 2007, Australian Bureau of Statistics. Retrieved on 5 July 2009. ^ "50,000 milestone coming closer" (Press release). Adelaide Crows. 23 May 2006. http://afc.com.au/default.asp?pg=news&spg=display&articleid=267980. Retrieved 28 May 2006. ^ South Australian Amateur Football League. Retrieved on 5 July 2009. ^ Reds finalise squad for ACL Knockout Stage – Adelaide United FC 2013. Footballaustralia.com.au. Retrieved on 16 July 2013. This page uses content from the English language Wikipedia. The original content was at South Australia. The list of authors can be seen in the page history. As with this Familypedia wiki, the content of Wikipedia is available under the Creative Commons License.